This guide provides an end-to-end example for how to use Oracle Enterprise Manager Ops Center. Using Oracle Enterprise Manager Ops Center, you can configure and install logical domains on Oracle VM Server for SPARC systems. A logical domain is a virtual machine with resources, such as a boot environment, CPU threads, memory, I/O devices, and its own operating system that runs independently on Oracle VM Server for SPARC Control Domain. Oracle Enterprise Manager Ops Center provides a complex plan that includes the steps to create logical domains and to provision an operating system on them. Resource configuration of 8 CPU threads, 4 GB of memory, and 50 GB of disk space. NAS Storage library to store the metadata and for the storage disk space. Oracle Solaris 10 9/10 operating system to provision the logical domains. Operating system installed with Agent Controller. Operating systems are not placed in a server pool. See Related Articles and Resources for more information about Oracle VM Server for SPARC and creating logical domains. 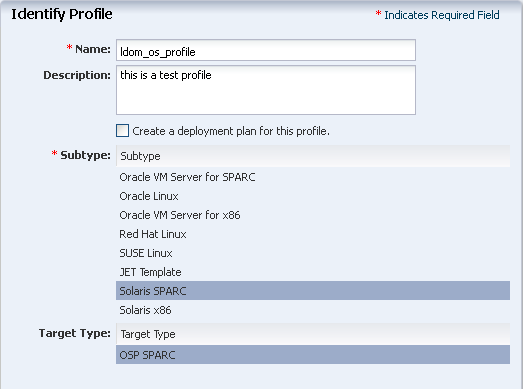 A server installed and configured with Oracle VM Server for SPARC 2.1 using Oracle Enterprise Manager Ops Center. Refer to the guide Oracle Enterprise Manager Ops Center Deploying and Configuring Oracle VM Server for SPARC. A network connected to the Control Domain. The logical domains and the Control Domain must be in the same subnet. When you want to use a particular network to the logical domains, you must first attach it to the Control Domain. Refer to Oracle Enterprise Manager Ops Center Feature Reference Guide for more information about attaching networks to the Control Domain. A NAS storage library associated with Oracle VM Server for SPARC. The library is used to store the logical domain metadata and to provide disk space. You must allocate appropriate virtual disk to the logical domains. The minimum size of the virtual disk for the logical domain to contain the Oracle Solaris OS is 8 GB. The maximum size of the virtual disk is 100 GB. In this example, allocate 50 GB to each logical domain. An Oracle Solaris 10 9/10 OS image to provision OS on the logical domains. Upload the OS image into Oracle Enterprise Manager Ops Center. Refer to Oracle Enterprise Manager Ops Center Feature Reference Guide for more information about uploading or importing OS images. A user with Virtualization Admin and Profile and Plan Admin roles to create and install logical domains, and to create profiles and plans. In this example, the logical domains are installed on Oracle VM Server for SPARC 2.1 version. The Control Domain is configured and deployed in stand-alone mode and it is not placed in a server pool. Eight core with eight threads per each core. Total 64 CPU threads. Create a logical domain with the resource requirements as described in the previous section. Click the Plan Management section. Expand Profiles and Policies and select Logical Domain. Click Create Profile from the Actions pane. 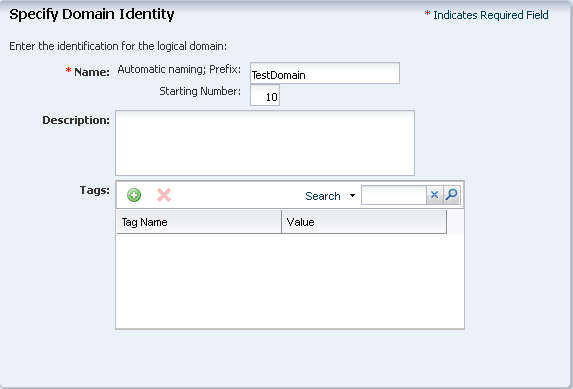 The Create Logical Domain Profile wizard is displayed. Enter a name and description to identify the profile. 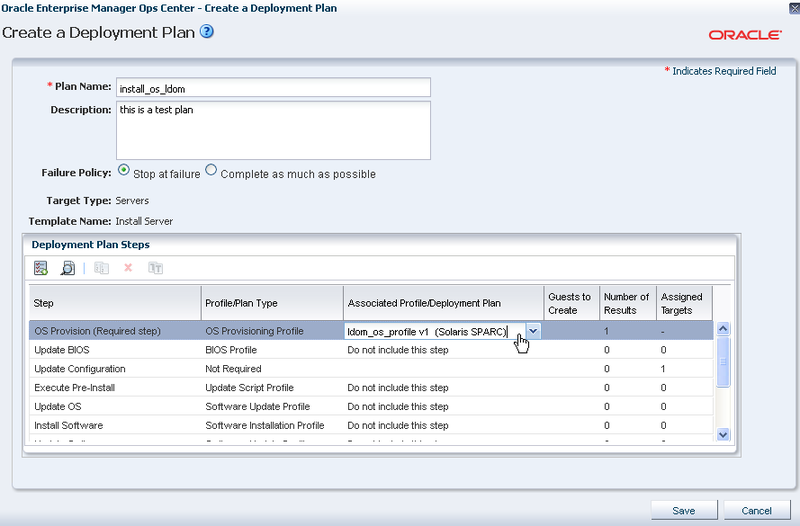 Deselect the option Create a deployment plan for this profile. Enter the name of the logical domain as TestDomain and the starting number as 10. The two logical domains will be created with the names TestDomain10 and TestDomain11. Provide description and add new tags for the logical domain. All the logical domains created using this profile uses the same description and tags. Click Next to configure the CPU Threads and memory. Do not specify a value for Crypto Units. Depending on the number of CPU threads, the Crypto units are assigned automatically. Select Automatic Recovery and provide the value of Priority of Recovery as 10. Click Next to specify the storage for the logical domains. Select a NAS storage library to store the logical domain's metadata and for the storage virtual disks. Enter the disk size as 50 GB. Click Next to specify the networks for the domains. Select the network from the list of networks that are in the same subnet as that of the Control Domain. Enter the number of connections for the network. Click Next to view the summary of the logical domain details. Review the information and click Finish to save the profile. Upload or import an Oracle Solaris 10 9/10 OS image into Oracle Enterprise Manager Ops Center. Do not use the default profile and plan created while importing the image. Instead, create a new OS provisioning profile and plan. Click the Plan Management section in the Navigation pane. 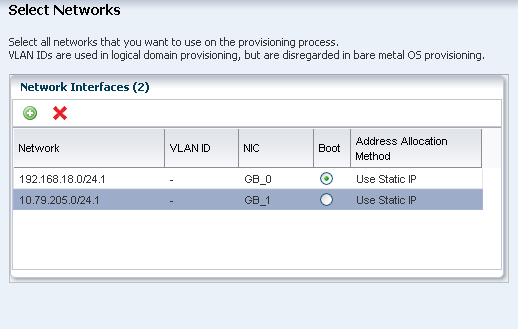 Expand Profiles and Policies and choose OS Provisioning profile. Click Create Profile in the Actions pane. The Create Profile - OS Provisioning wizard is displayed. Enter the name of the profile as ldom_os_profile. Enter a suitable description for the profile. Select Solaris SPARC as the Subtype. Click Next to specify the provisioning parameters. Select the image from the list. All the images for Oracle Solaris OS on SPARC platform are listed. Select Entire Distribution Plus OEM Support as the Software Group. Click Next to specify the OS Setup. Enter the time zone, language, terminal type, console serial port, and console baud rate. The NFS4 domain is set to dynamic in this example. If a naming service is configured in your environment, enter the NFS4 domain value. 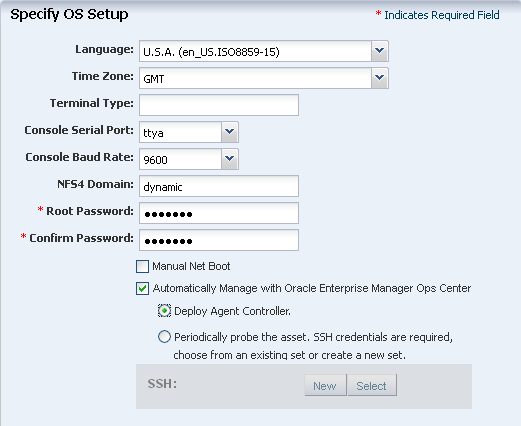 Select Deploy Agent Controller to manage the OS by Oracle Enterprise Manager Ops Center. It is optional to install any Jumpstart Enterprise Toolkit (JET) modules. Skip this step and click Next. Specify the file system layout for the OS. 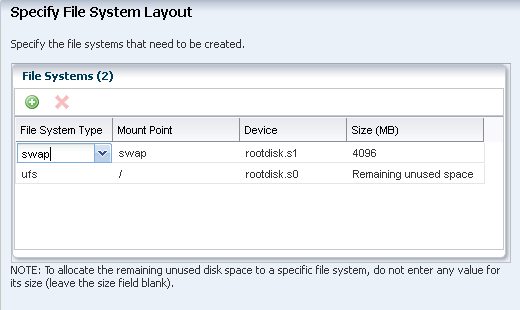 Retain the default partition that is displayed. Click Next to specify the naming service. Select None as there are no name services configured in the environment. If you have naming services configured in your environment, select the appropriate service and provide the details of the name service. In this example, we will not specify any networking options for the operating system. Select None and click Next to continue. Select the networks that you want to attach to the operating system. You can attach multiple networks to the operating system. Click Finish to create the OS provisioning profile. The OS provisioning profile is created and listed under the OS provisioning profiles. Use this profile to create an Install Server plan. In this example, create an Install Server Plan using the OS provisioning profile created in the previous section. The Install Server plan provides the steps to provision OS, install software, updates and scripts, and add monitoring thresholds. In this example to configure and install logical domains, limit the Install Server Plan to only provision the OS and skip the other steps. Expand Deployment Plans and select Install Server. Click Create Plan from Template in the Actions pane. The Create a Deployment Plan window is displayed. Enter the name and description for the plan. Select Stop at Failure option for the failure policy. 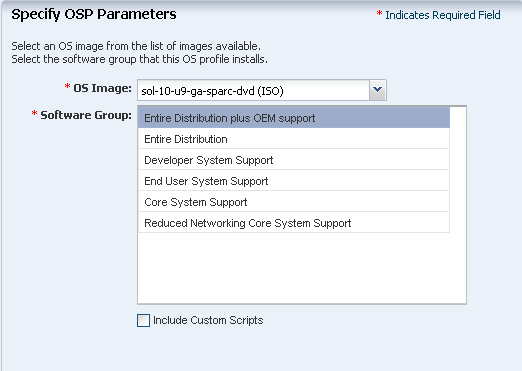 In the OS Provision step, select the OS provisioning profile from the list. Click Save to create the deployment plan. The new Install Server deployment plan appears under the list of Install Server plans. At this point, you must have created a logical domain profile and an OS provisioning plan to provision OS on a logical domain. 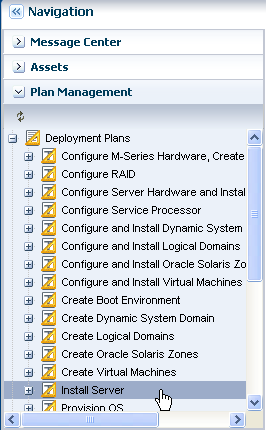 Use these profile and plan in the complex plan to configure and install logical domains. Create Logical Domains – Requires the logical domain profile. Install and Update OS – Requires the Install Server plan that includes the OS provisioning profile and other updates. Provide the logical domain profile and OS provisioning plan created in the previous steps and create the plan. Expand Deployment Plans and choose Configure and Install Logical Domains plan. Create a Deployment Plan window displays. Enter the name and description for the new plan. Select Stop at Failure for the failure policy. In the Deployment Plan Steps, select the logical domain profile and the OS provisioning plan created in the previous sections. Enter the number of guests to create as 2. This is the number of logical domains to create. The number of assigned targets for the Install and Update OS step automatically changes to 2. The logical domains created using this plan will have the same OS provisioning plan applied on them. If you want to assign a different OS provisioning plans to the logical domains, refer to the Oracle Enterprise Manager Ops Center Feature Reference Guide for more information. Click Save to save the deployment plan. Apply the Configure and Install Logical Domain plan, and provide the required resource assignments. Click Plan Management section in the Navigation pane. Expand Deployment Plans and select Configure and Install Logical Domains. Select the plan that was created in the previous section. Right-click the plan and click Apply Deployment Plan. Select the target on which you want to apply the plan. 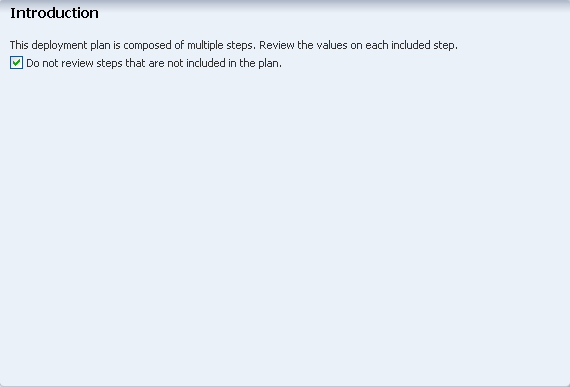 In the Introduction step, select the option to Do not review steps that are not included in the plan. This will skip the profiles and plans that were not selected in the plan. The wizard first collects the information for creating logical domains. In the Specify Domain Identity, check the naming of the logical domains. If the name defined in the profile is already allocated, then the name is marked in red. You must provide a unique name to the logical domains. Check whether the storage assignments are correct. You can modify if you want to change the disk size. Check for network resource assignment and click Next. Review the summary of information for creating logical domains. The next step indicates that the following steps in the wizard collects the data for provisioning OS in the logical domains. Click Next to continue. Specify the IP address for each of the logical domains to be installed with the OS. Provide the IP address in the range to be applied to the logical domains. You can also enter the IP addresses separated by comma. Review the network resource assignments. Make any modifications in the network assignment, if required. Do not pool the operating systems of the logical domain into a Oracle Solaris Zones server pool. Select the option Do not assign to a server pool. Review the summary of the information for provisioning the OS. Schedule the job to run now. Click Apply to run the configure and install logical domains plan. At the end of the execution of the job, you will have two logical domains TestDomain10 and TestDomain11 provisioned with the Oracle Solaris 10 9/10 OS. For each network connection, a virtual network device is created and the virtual NIC is named as vnet0. A MAC address is allocated to the vnet. The virtual network device is connected to the virtual switch in the Control Domain. In the Control Domain, for each network connection, a virtual switch is created and the switches are named accordingly. For example, a network 192.168.0.1/24, the virtual switches are created as 192.168.0.1_24, 192.168.0.1_24_1 and 192.168.0.1_24_2. The virtual switches are incremented according to the number of connections made to the network. The logical domains are allocated to the first available virtual switch when configured and installed. You can also select the virtual switch when you shut down and start the logical domain. See http://www.oracle.com/technetwork/documentation/vm-sparc-194287.html for Oracle VM Server for SPARC documentation. See http://docs.oracle.com/cd/E27363_01/index.htm for Oracle Enterprise Manager Ops Center documentation. Copyright © 2007, 2012, Oracle and/or its affiliates. All rights reserved.